Do you ever look at your liquor collection and think, "if I didn't know any better you would think college students live here!!" I had one of those moments the other day. Today's blog post is brought to you by my husbands bright idea. While pouring me a beer he laughed about the contents of our liquor cabinet. 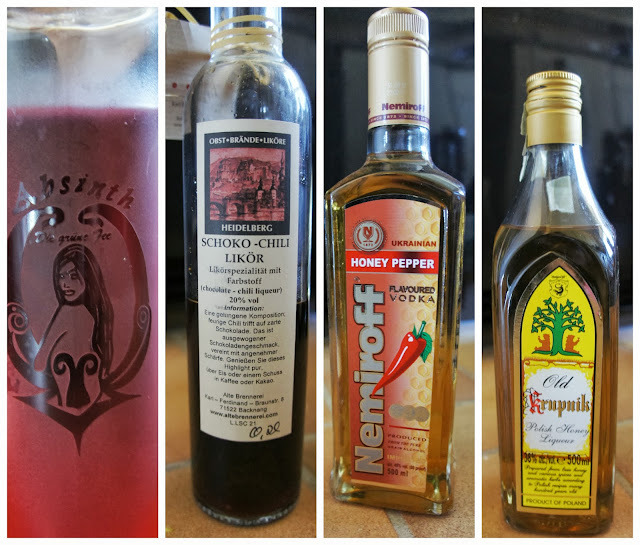 He mentioned it was one of the little known perks of having nothing but international friends, you end up with a rather eclectic booze collection. Then he said the immortal words, "you should blog about that. Call it, me and my liver, a liquor cabinet tour." Genius! So here we go, a tour of our booze collection. Like most grown ups....or people who like to think of themselves as grown up from time to time. We have wine. Some of it it came as gifts when we had our barbecue in July. Others found their way back to our place after the 20% off wine sale the grocery store has every so often. Yes, booze at the grocery store is one of the many things I love about living here...especially at our local grocery store...the beer aisle is on the way to the check out....super convenient. Some of our wines even come with corks in them. Fancy! And look we even have a selection. The husband and I are red wine drinkers for the most part but we keep some white and one rose on hand just in case. Now I'm going to let you in on something John and I particularly love about living in Europe. Giant beers. The bottle of Erdinger is there to show scale. Keep in mind a bottle of Erdinger is actually bigger than your average beer anyway. Those lovely huge class things hold beer. The one with the fancy handle comes from a local brewery at the end of the S7 train line. Every Friday between 2 and 5 you can go and get it filled for about 10 francs. The first time you purchase one it will cost you 48 francs but refills are 10. Inside that lovely ornate bottle is fresh beer. What I mean by that is the beer comes directly from the fermentation barrels. It's unfiltered and the yeast ferments in the bottles. Then....this is the best part...with beer in hand, with some friends and some glasses (you can purchase some at the brewery for cheap or bring you own) stand around in their parking lot and drink. Yup. The first time John and I took part in this lovely experience we asked a Canadian he worked with how long they had been doing this. Apparently the brewery has been doing this since the dawning of time. And he remembers when the beer use to be free. Then it got to popular so they had to start charging a little bit. It was easily one of the most pleasant experiences. It was a lovely day. We had lovely company. Sure we were standing in a parking lot drinking but that's not a big deal here like it is in Canada. Next we have the clear liquors. You know sometimes you want to feel like you're a 20-year-old girl so that's why we have malibu. Also you can't make a Moby Drink without it. Gin is a stable as anything with Gin in it is my drink of choice. The fancy smancy vodka was a gift from a friend. It's named after an Epic polish poem called "Pan Tadeusz" by Polish poet, writer and philosopher Adam Mickiewicz. And that little bottle in the front that says Korn. Well that's Northern Germany's cheapest kind of liquor. It's kind of like vodka but it's not as rigorously filtered and I'm fairly sure it will make you go blind. Now, we let our whisky/Canadian flag fly for a moment. Like any good Canadian expat we have bottles of both Crown Royal and Canadian Club. On the end is a bottle of buffalo grass whiskey. That company actually makes my preferred vodka. Now we're getting into the weird. stuff. Everyone has weird stuff lurking in their booze collection. Before we moved overseas we had a big bottle of blackberry liqueur in our cupboard for who knows how long. I needed about a half cup of some one time for some ice cream I was making. And then it sat in our cupboard until the night we left our apartment. And if I'm not mistaken it may have originally come to our apartment in Winnipeg from our apartment in Brandon. Yeesh. From left to right we have Red Absinthe. 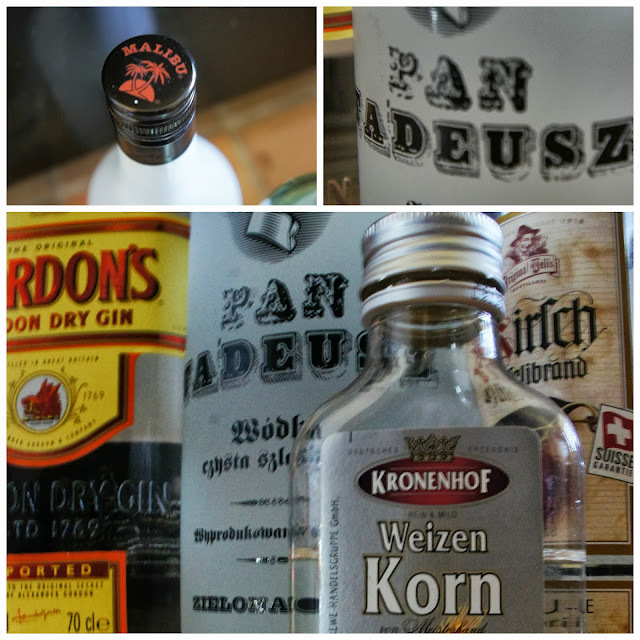 Did you know Absinthe was a Swiss invention? Yeah...neither did I. Next chocolate chili liqueur which is over a year old. But it gets a lot of use in the winter when we make hot chocolate. Next we have 9 Euro honey pepper vodka. I'm certain it will make you go blind. It's never been opened and I'm sure you're wondering why we even have it. Fun story, John went to Kyrgyzstan and was given a sample pack of vodkas that had this one in it. John put a shot of it in his tea when he had a cold. Let's just say that stuff will cure what ails you....by making your forget you were sick in the first place. The last item is polish honey liqueur. Also a gift. Also pretty much guaranteed to make you go blind and clean paintbrushes. Apparently my dads uncle use to make his own. It was so thick you could spread it on bread. Last but not least in the weird stuff department we have this. First let me tell you those are not the original bottles. No. The original bottle was a coke bottle. Seems legit right. Well as a gift from one of his hosts in Laos John was given some homemade ginseng infused local booze. I'm pretty certain if I cut myself and used that to clean the wound it would work better than your regular drug store antiseptic. So there you have it. My liquor cabinet. My liver hurts just thinking about it. Hahaha! Fantastic!!!! I am also a huge fan of gin. Love love love it! All that's missing is a moonshine still in the backyard. I am curious about the homemade ginseng booze. It looks potent just from the picture. We have homemade booze too! Apparently it's quite common in France. We have Prune Liquer made by my mother-in-law and Pear Liquer made my my husband's uncle. Both are digestives and both could probably strip the paint of the side of a house.